Photo Essay on March 17, 2019, "Shooting Trains" PSA Roundup Chapter Event. The Orange Empire Railway Museum opens at 9 a.m. Plan to arrive at opening time to see them bring out the steamed-up VC 2 for the day's duty. If the gate from the parking lot is not open at 9, just call the phone number on the gate and they will come out and open it. Above, the engineer was working on a short circuit to the headlight which had to be working for the daily runs north to the Perris, California Station. As it turned out, he got it fixed and the first run was at noon rather than the advertised 11 a.m. departure. However, the trolley is the same 4' 81/2" gauge as the main line, so it was brought up on the main line so I rode the same route in a trolley rather than behind steam. During the day guests could ride all vehicles that were running that day, if they had paid $12 for an all-day ticket from the gift shop/office. Steam-VC 2 Ventura County Number 2, commonly referred to as VC2 is a steam locomotive built in 1922. The Ventura County Railway No. 2 is the Museum’s operating steam engine. Being on site at the 9 a.m. opening allowed fellow photographers to photograph railroaders at work on the steam locomotive at they attended to several items. Extended time was spend on an electrical short to the headlight allowing time for more photos. Some photos were converted to black and white to make them more vintage. Others were three shots treated as HDR in Lightroom. With my camera's articulated screen, I could position it low between the rails and still see a live view in the tilted screen to frame the shot from this extremely low position. Inside the two coaches, volunteers were positioning the windows for the day's runs. View from the last car in the consist. Other volunteers attended to mechanical duties. You can see why Brakeman was one of the most dangerours jobs on the early railroads. Repair work took so long, the Fireman had to Let off Steam since it was not being consumed by movement, making another photo op. Making progress finding the headlight short-circuit. Meanwhile, the trolley operators brought out No. 10 for guests to ride. A single-truck trolley of standard 4' 8 1/2" gauge which had been used in the movie "Singing in the Rain", later stored, then used in Tuscon service, restored and returned to OERM. Electric power from cantenary, onboard compressor for air brakes, foot-pedal for ringing the bell at crossings. Carson also operates the trolleys in Disney California Adventure Park. His training was here at OERM. For a longer ride than the normal around-the-grounds, No. 10 was taken out on the mainline for a run. At the end of the run on the mainline, the connection to the cantenary is moved to the back and the operator goes to the opposite end to run back to the museum. No. 10 continued to make runs around the grounds as I explored other exhibits. At noon, the steam engine was making trips and No. 10 Trolley was on a siding so you could see the size comparison. The last car built by Ward Kimball's 3 ft. gauge series was this cattle car replica with snow-covered mountains in the distance. On my way to the northern section of the Museum, I spotted UP No. 2564 on a back track. Using 3 images at different exposures, I was able to get the "Grizzly Flats Railroad" sign on the barn outside exposed and still see the desk inside. The Cottonwood Station is a good spot to watch No. 2 take riders on the excursion runs. I asked a nice Asian fellow, who said his English was not good, but who had a camera, to take my photo on my phone. He did a fine job. For the video above, I had my iPhone propped on top of my camera lens and took some photos while making the video. You may hear my camera's shutter go off as the train passed. Below are some of the still shots I got of the passing No. 2. While processing this photo, I noticed that the trees in the background are all leaning south, making the train appear to be speeding through them. I wondered if this photo would look good as a monochrome. Which do you like best? Back at the museum station, I continued taking HDR photos. Next, I entered the barn with Chloe. It seems that certain locomotives, perhaps other cars, have sponsors. Ward Kimball, a friend of Walt Disney, purchased this locomotive in 1948 from a sugar company overseas. This locomotive is the same size as the ones in Disneyland. The 3-foot gauge locomotives of this type were used around mills, mines, logging, and other industrial sites. In the same barn this Model A rail runner was being restored. The cattle catcher was newly fabricated. On the way out of town, I noticed nearby hills were covered with poppys as were hills all over Southern California. As you can see, Orange Empire Railway Museum in Perris, California is a perfect place to photograph vintage trains and other railroad memorabilia. 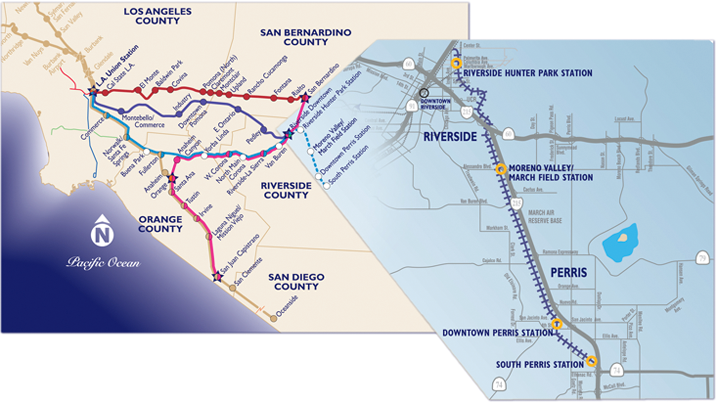 Since the OERM tracks go within 200 yards of the Perris Station, it is my hope that someday one could take Metrolink from LA and Orange Counties to the Museum.